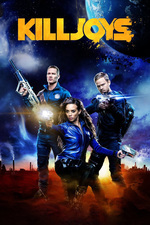 Den of Geek review - Delle Sayeh finally gives birth to the hybrid child, but his growth spurts force the team to seek outside help on tonight's Killjoys. Gared is rapidly becoming my favorite character. I enjoyed this one more than the past few - I dunno, it was more kinetic? Poked more fun at itself? That's what I expect from Killjoys, and man it was getting too serious earlier this season. What's the opposite of toxic masculinity? Because that's what Jonny, D'av, Pree and Gard have. This show is really good at this. Also, it's a measure of how far the characters have come that the news that Khlyen has messed with your memories elicits a relieved smile. Not much to add, only: I LOVE THIS SHOW!!! This show really has come a long way since season one. The fact that they took what was essentially a throwaway joke of a character, the big dumb boyfriend, and made him into an actual characters speaks volumes about the care the writers take with the the world they've created. Good stuff. Also, don't hurt poor Pip. Please. Pip is likely pathos now. The bug is probably going to kill him in some way. Either by taking over or poisoning him when they realize that they need to get it out. The better writing for Gared makes me wonder if Pree is part of the season finale pathos. I'll give the writers credit for aging up the baby in a way that turns the character into something potentially useful, that creates all sorts of future guilt for D'Avin and Dell Sayeh who didn't get a chance to raise the kid, that put tension on Johnny's and Lucy's relationship, and that gave the viewers a fun, light kidnapping story. Character development is really becoming a strength of this show, with Pree and Gared and Pip and even Turin becoming more interesting, well-rounded characters. Delle Sayeh has also really started to come into her own and watching her become more human should be a blast. And for actor watchers, the teenaged kid is played by an actor who was also in Expanse last season, if that was bugging you like it bugged me. There's a lot of supporting-actor overlap with The Expanse. Pip and Zeph even had scenes together over there (Pip as a serious young naval officer and Zeph as a hotheaded revolutionary so, yeah, getting a chance to try different things). Fancy was an admiral. I'm looking forward to seeing Pree as an advertising executive or something like that. Agree with Mogur re: social equality. This show does it pretty well, in general. Gared (the bartender, right?) being 'progressive' is just the pebble that could either fall off the cliffside on its lonesome, but if it was accompanied by other pebbles - many of them - from other stories? We might see the start of an avalanche. I'm looking forward to it, but that we point out an instance of this suggests that its still too infrequent. I'm loving how Pip is bringing up the physical (to start with, thermodynamics) impossibility of what they're observing, and his less-than-perfect understanding suggests feeding the child more. Feels like a fight in the writer's room. No way that entity has consumed enough nutrients during that timespan limited to that inventory to develop to the first instance of the baby growing. I am so glad someone has finally addressed Dutch and Klein's relationship as hellova toxic. A parent (or parent figure) can still do vast amounts of harm with the best intentions.